Commit to supporting a local farm and family while eating truly fresh, seasonal, organically grown vegetables. Sign up for our CSA (Community Supported Agriculture) Vegetable Boxes! Signing up for our CSA gets you a freshly harvested weekly batch of some of the best vegetables from our farm. The vegetables in your CSA Box will vary by week according to season and we aim to include between 5 and 7 different types of vegetables in your box each week. We offer Summer and Autumn CSA boxes for pick-up in Abbotsford and Chilliwack. We only grow varieties of vegetables that we think taste great – with a few trials thrown in each year. We think the CSA Vegetable Box is the next best thing to a backyard garden. It can also supplement your growing efforts if you do grow some food for yourself. Most of our vegetables are harvested, sorted and cleaned the day (or day before) you pick them up. We take care to harvest crops at the best time of day to maximize their freshness (i.e. greens are harvested in the morning before they wilt). We also make good use of our cooler room to store harvested crops before it’s time to put together the boxes. Is the CSA box a good fit for everyone? For many it is. If you’re wanting to eat local and appreciate the convenience of having your freshly harvested vegetables selected and ready for you each week it’s a great arrangement. That said, if you’re not up for a ‘surprise box’ of organic vegetables each week and prefer to have your say of which vegetables make it into your kitchen, then we recommend visiting us at the market to buy exactly what you’d like. Also, if you don’t have time to add the weekly commitment of coming to pick up your box, you may want to opt for the spontaneous option of coming to the market whenever it suits you. Our CSA members are integral to the sustainability of our farm. Having CSA members secures a market for a good percentage of our crops. By signing up with us you become a partner who shares in the risks of organic farming. Some seasons we experience crop failures or have crops effected by pests. While you’ll get your full box of vegetables each week, we appreciate your willingness to deal with the unexpected. No, we don’t. The CSA Vegetable Box is a terrific opportunity to eat in-season and get to know some new vegetables. We’ve seen people come to love vegetables they weren’t so sure about when they first received them (like Fennel for example). 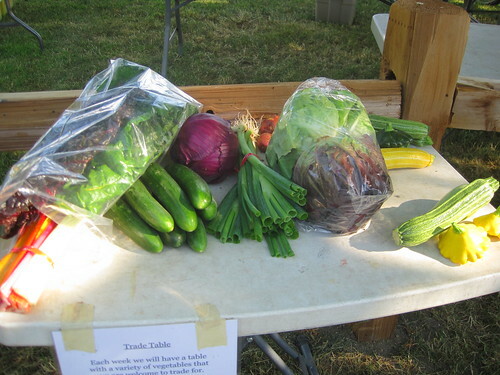 That said, each week we do have a ‘trade table’ with a variety of vegetables that you are welcome to trade for. If there’s something you don’t want in your box, simply put it on the trade table and take something you’d rather have (I.e. all of your cucumbers could be traded for the cherry tomatoes or all of your potatoes could be traded for a head of lettuce). Wondering what size Box you should sign up for? Families of 4 or more usually sign up for a large box, while smaller families and couples usually choose the regular size box. 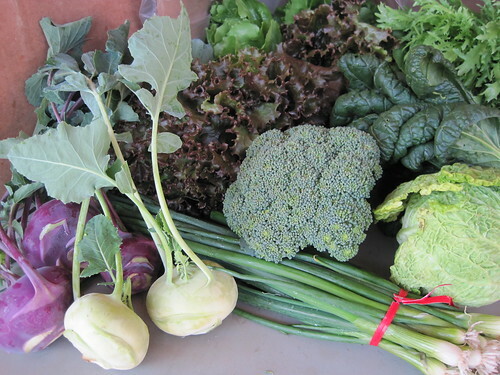 Late May regular CSA box: kohlrabi, green onions, cabbage, broccoli, tatsoi, frisée, lettuce. 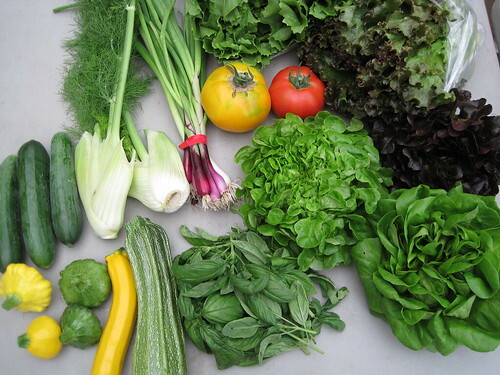 Large mid-July CSA box – cucumbers, fennel, green onions, beefsteak tomatoes, Salanova mini-leaf lettuce, red loose leaf lettuce, escarole, basil, summer squash. If you want to pre-order specific vegetables in addition to what’s in your box, please email us and we’ll have those vegetables ready for you (based on availability) to pick up alongside your box. Payment for extra items is due when you pick up your box. We need to hear from you by 6pm the night before your box day to make this happen. Each week, we will pre-pack your box with a freshly harvested assortment of vegetables according to the season we’re in. Here is the list of the vegetables we plan on growing for our 2019 CSA Boxes. Tomatoes, Peppers, Eggplant, Cucumbers, Sweet Onions, Shallots, Potatoes, Kale, Lettuce, Spinach, Beets, Cabbage, Carrots, Radishes, Salad Turnips, Swiss Chard, Green Onions, Fennel, Kohlrabi, Zucchini, Rapini, Summer Squash, Winter Squash, Basil, Cilantro, Parsley. Winter Squash, Potatoes, Tomatoes, Peppers, Eggplant, Cucumbers, Sweet Onions, Shallots, Kale, Lettuce, Spinach, Beets, Cabbage, Carrots, Radishes, Salad Turnips, Swiss Chard, Green Onions, Fennel, Kohlrabi, Rapini, Cilantro, Parsley. Due to the unpredictable nature of farming, we cannot guarantee that all the listed vegetables & herbs will be included in your box. I am not familiar with some of the vegetables on your list. Do you provide any resources for how to prepare vegetables that are new to me? Yes, we do! On the evening of your box pick up, we send an email to you listing the vegetables that were in your box that day. With so many recipes online these days, we trust that knowing the names of the vegetables in your box will get you on your way as you search for recipes and preparation ideas. We also like to include some of our favourite recipes in this email from time to time. Many of our favourite recipes can be found on our website’s ‘Eating’ page as well. We welcome your questions about vegetables that are new to you. That said, we may have limited time to give you super-in-depth answers on CSA pick up days, depending on how busy it is. We invite you to join with us on our sustainable growing adventure! We hope you will delight in discovering the culinary creations made possible with the finest vegetables from our farm, season to season.